Heat oven to 375°F. Grease bottom and sides of loaf pan, 9x5x3 inches, with shortening. Mix 2 tablespoons granulated sugar and the cinnamon in small bowl; set aside. Stir Bisquick mix, milk, 1/3 cup granulated sugar, 3 tablespoons butter, the vanilla and egg in medium bowl until soft dough forms. Shape dough into 1-inch balls; roll in cinnamon-sugar. Place dough randomly in pan. Sprinkle with any remaining cinnamon-sugar; drizzle 2 tablespoons melted butter over dough balls. Bake 25 to 30 minutes or until golden brown. Let stand in pan 10 minutes. Remove from pan to wire rack. 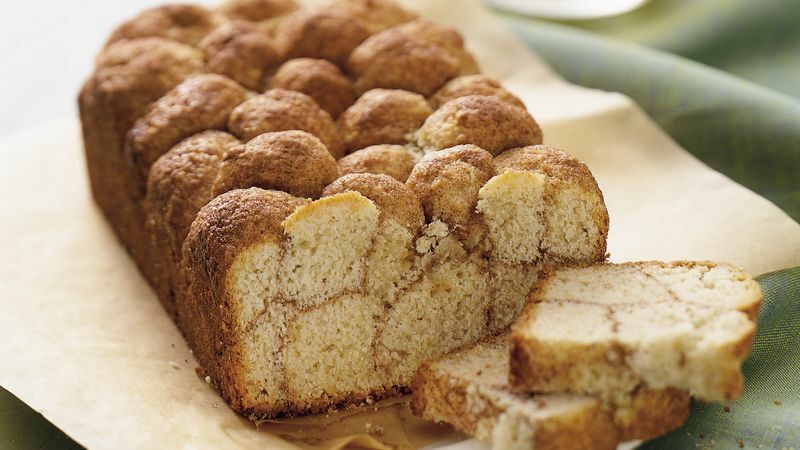 If desired, make glaze by mixing powdered sugar and water in small bowl until thin enough to drizzle; drizzle over loaf. Cut into slices. Serve warm. Make it a family affair! Mix the sugar and cinnamon in a plastic food-storage bag, and have the kids shake the pieces of dough in the mixture.